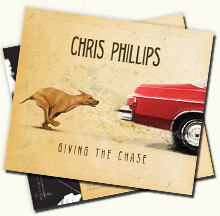 "Giving the Chase", Chris Phillips's debut solo album, is a collection of the many different musical styles and tastes that Phillips has ever enjoyed and emulated and bla bla blaaaaaaaaaaaaa! Okay, so I'm not very good at telling you about myself in the 3rd person. But what I can tell you is that if you really like an album where the instrumentation is true, the lyrics are honest and sensible, the vocals are raw but smooth, and the songs are like a group of lifelong friends, then you should throw "Giving the Chase" into your car stereo and take off for a 53 minute road trip. In "Giving the Chase" thirteen tracks tell the story of love found, love lost, self lost and finally the finding and re-emergence of self; and in that order too. Each song started out as a piece of drift wood washed up on the beach. Dozens of incredibly talented New England artists wielding cellos and horns and strings and percussion whittle each song down into its own hand crafted piece. The end result hits the ears with, thankfully, about half the complexity and drama I've described above! But it's all there. In the end, "Giving the Chase" tells the story of a fantastic life cycle that most of us perpetually experience again and again in one form or another. Of the human condition that has us all seeking and searching and the fulfillment we get from the chase alone. Like a dog that gives chase to a car. Here are some of my songs. Thanks for checking out my website. My new album, Giving the Chase, is now available to order through this website using the Paypal Buy It Now option above. It's also available for order or digital download through CD Baby. Saturday, December 1st Acoustic @ The Landing 7 Central in Manchester by the Sea! !